Privileged Chinese-Jamaican brothers Lester and Carter Chin Ellis have enjoyed a sheltered life as the heirs to the iced desserts empire Chinchillerz. One fateful night, following a fiery encounter with local law enforcement the brothers are taken to Pelican Walk Police Station, where Lester is detained for drunk driving, while Carter is released without charge. When Carter is shot dead within minutes of leaving the station his murder throws the police force into crisis mode. Discredited Detective Raythan Preddy is put in charge of the murder case and is forced to accept the assistance of Detective Sean Harris, a Scottish lawman seconded to Jamaica. With his superiors watching his every move and the Chin Ellis family interfering with the investigation, Preddy is determined to catch the killer and save his career. There's a lot to like about this debut crime novel, and overall I enjoyed what was a fast-paced and exciting read. 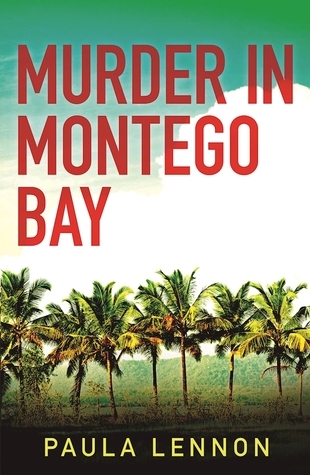 Lennon takes readers to an exotic location, a tropical island 'paradise', and delivers a dark tale with plenty of grit and corruption, belying the 'smiley-faced' Jamaican stereotype. .
Detective Preddy is a proud Jamaican with a stain or two to his name, thanks to a high profile bust that went horribly wrong. He's unsure of his position within the police, but not unsure of his own skills as an investigator. So he struggles when an outsider who's been seconded to his team from overseas, Scottish Detective Sean Harris, seems to be favoured by the local bosses. Is this typical island inferiority, believing that someone from abroad must naturally be better trained or more skilled at their job? Particularly a white man? As far as the ganja-drinking Preddy is concerned, this is his patch and he knows better about catching local criminals than anyone else, whatever the bosses think. That belief is put to the test with a tricky case, when one of the heirs to the popular Chinchillerz empire is gunned down shortly after being released by the Jamaican police. On the same night Carter Chin Ellis is murdered, his brother Lester is assaulted while in police custody. It's a media nightmare for the local cops, which sees the already tropical temperatures raised several notches. Questions swirl about their competence, even whispers of corruption, as Preddy and his under-funded colleagues try to track down who is responsible. Harris provides an intriguing foil, the foreigner who might be more, or less, than he seems. Is he a political stooge? Or a hard-working investigator who just has different methods to the proud Preddy, and is happy to voice his disagreement at times? Overall, I enjoyed MURDER IN MONTEGO BAY, and I'd definitely read more from Lennon, if she keeps up with the crime writing. I particularly liked her evocation of the Jamaican setting, which more than just being an 'exotic location', she brought to life in a number of ways, from local customs and lifestyles, to the environment and range of people who populate the Caribbean island. I felt like I was there, alongside Preddy and Harris. At times I thought the local patois might have been a little overdone, pulling me out of the story - but that may have been because I wasn't quite fully drawn into Preddy as the main hero. I was observing (and enjoying) his adventures and efforts, rather than fully empathising or being sucked into the unfolding story without question. I was a little conscious that I was reading a story - an interesting a pretty well-told one, nevertheless - rather than 'living it'. Having said that, I think that Preddy and Harris could grow into really interesting series characters, if Lennon were to continue their adventures (or Preddy's alone). There's an unusual and interesting dynamic between them, quite believable and multi-layered. Two proud men trying to do their best, with good intentions, but not quite clicking, so grating on each other and providing plenty of drama. A good debut that shows plenty of promise, a gritty tale set against a vibrant backdrop.